I used to joke that the only time I use pens is for exams and immigration cards. As everyone has their favourite instrument for expressing themselves, mine is a computer keyboard and markup. So when I can find a pen that gets out of the way and writes with a minimum of fuss and cost, I latch onto it. 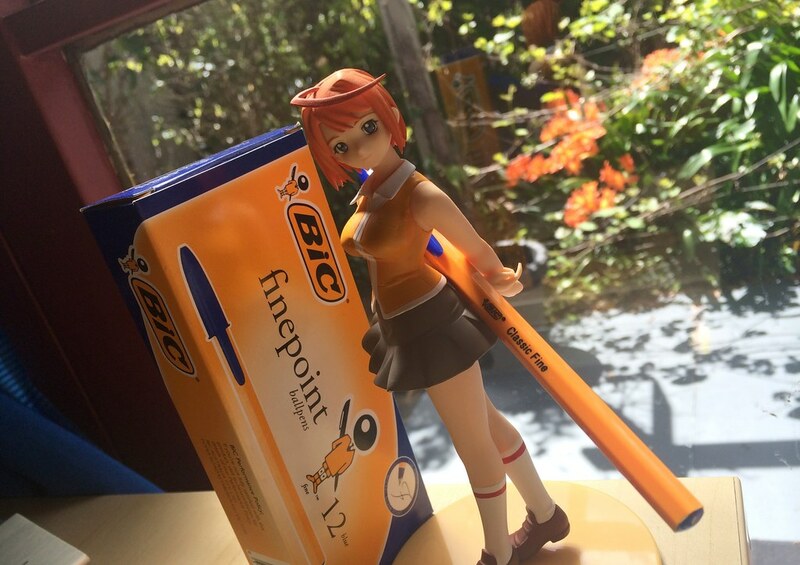 Of all the ink types and brands available, I keep coming back to the Bic Orange Finepoint, as held by our orange–haired mahou shoujo Mai above. Some markets list them as the Bic Classic Fine, or the Bic Orange Ballpen, or mistakently as the Bic Crystal. Whatever they’re called, the Orange Finepoints are sturdy, draw incredibly smooth lines without smudgeworthy gel inks, and are available everywhere for cheap. They’re also bright orange, which makes them easier for absentminded people like me to spot. Jony Ive spent a large amount of time when introducing the MacBook talking about the “perfect coefficient of friction” for their glass trackpads. These pens are almost the same to paper. A variant is the famous Bic Cristal [sic], which is the same but with a transparent shell. You can see the remaining ink with those, but I just like the feel of these more.